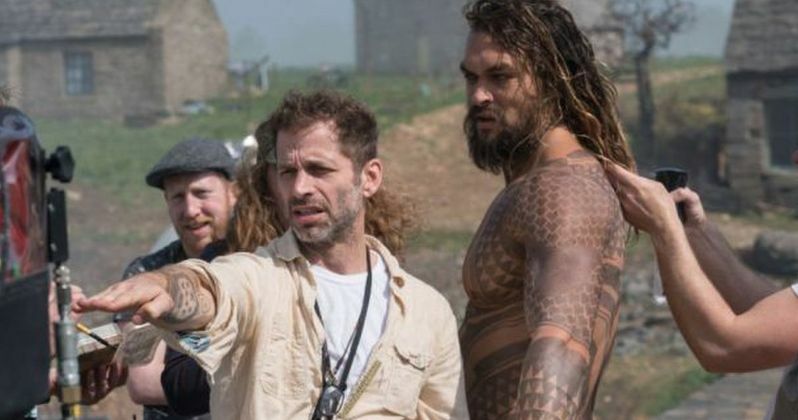 Zack Snyder earned his Aquaman executive producer title by helping to shape the Arthur Curry character. Snyder left Justice League right before the project was going into its lengthy and costly reshoots. Joss Whedon was brought on to takeover, which resulted in a markedly different tone from what Snyder originally had in mind and has caused a pretty big stir amongst DCEU fans who later demanded that Warner Bros. release Snyder's original cut of the movie. It appears that Snyder helped James Wan steer the Arthur Curry character away from what Whedon did with him. Justice League features Jason Momoa's first take on Arthur Curry and it is a lot different from the character that we just saw on the big screen in James Wan's Aquaman. Neil Daly, an independent freelance market research analyst, has taken part in the test screenings for many of the DCEU's projects, including Justice League and Aquaman. Daly alleges that most of the "teenage boy sexual humor" comes from Joss Whedon, which is why Curry spends a lot of the previous movie trying to hit on Wonder Woman. Daly explains. "We could have gotten a whole movie about Aquaman basically fawning over Mera the whole time and making all kinds of dirty jokes and things like that and they really had to get away from that, which is all what Whedon had done..."
Since Zack Snyder was the one to originally cast Jason Momoa as Aquaman, James Wan reached out for some help in shaping the character. It had been reported late last summer that Snyder was getting an executive producer credit on the movie, which surprised some fans. However, it looks like he was involved a lot more than originally thought. Neil Daly had this to say. "Snyder had a little bit of an influence on Aquaman. James Wan was showing Zack Snyder, against the studio's wishes, cuts of the movie and early test screenings and storyboards to make sure that they're on the same page with what he originally wanted and Snyder gave his blessing of approval, bringing it back to what he wanted all along." The Arthur Curry in Aquaman is not trying to hit on Amber Heard's Mera the whole time, which is refreshing. A lot of fans were ready for some cheesy humor and some of that left over attitude from Justice League to creep into the Curry standalone movie. Thankfully, it did not and that could be a big factor as to why the movie is doing so well at the box office. Aquaman has officially crossed the $1 billion mark at the worldwide box office and is setting DCEU records. The tone of the project is much different from Zack Snyder's movies and even different from Patty Jenkins' take on Wonder Woman, which was another huge hit for the studio. However, contrary to popular belief, the lighter tone was not a reaction to Snyder's past DCEU work, according to Warner Bros. film chairman Toby Emmerich. The fact that Snyder helped to shape the Arthur Curry character helps to cement that fact. You can hear what else Neil Daly had to say about the DCEU and test screenings over at the Fire and Water Podcast.